Our product range includes a wide range of 100% cotton women 's black colour dress, 100% cotton women's petrol green dress, women cotton dress and women's round neck 100% cotton dress. 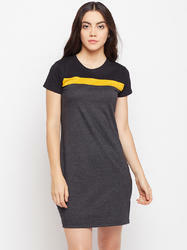 The Dry State brings you this limited edition V neck 100% cotton Dress having a quality which none can match. We are known to provide the best quality in the design's print. The design has NO FEEL print quality and doesn't fade with time..!! Meaning No Rubber Print, No Bleeding Of Colour And No Shrinkage Of Fabric..!! Grab Now..!! As an esteemed name in the industry. Our offered ladies Cotton Dress are stitched with soft fabric with the aid of advanced fabrication techniques as per the set standards. Moreover, we offer these ladies dress in various designs, sizes and color combination as per your choice. Customers can avail these ladies dress from us in a promised time frame at reasonable rates.